He's legitimately surprised every time he turns himself into a chicken. So what happens if this hits a Hero Card like Bloodreaver Gul'dan? Well... It's not a minion, so it draws it. The worst card statistically from GvG. Either was mediocre or downright game-losing. Sometimes I see this card in arena and I'm just amazed that 1 of 2 things happened. 1. The opponent REALLY misjudged how bad the card can be. 2. This card was legitimately better than the other 2 options. Could easily be a (2) drop and still it wouldn't see much constructed play. Only in specific decks such as freeze mage (Where it would actually be quite useful, meanwhile not actually broken). I'd argue that the Polymorph effect is as bad or worse than the deathrattle, and its cost makes no sense. This card is insanely underpowered compared to the severe Power Creep that took place in GvG and it saddens me that such a good concept went to waste. It would also be an incentive against aggro, which is exactly what Hearthstone needs. This card is bad because its traits are pulled in opposite directions. Aggressive decks have too many minions to consistently not get chickens. Spell-based decks (Freeze Mage?) have no need for a 3/2 body. After GvG came out I got three of those from 22 packs and decided to give it a try with a mage. I made all-spells deck with both of these and 2 mana wyrms. 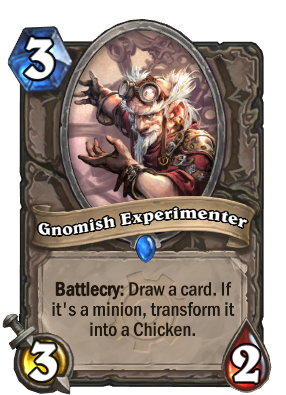 So, guess what - both games that I played with that deck, gnomish experimenters turned the other experimenter in a chicken. Strangely enough - i won first game and almost won a second one anyway. Same as Fel Reaver, the card destroyed by this guy does not matter unless you eventually draw your entire deck. And as 90% of all games don't end in fatigue, this card might as well have no drawback. What is the difference between a card you never draw in a game and a destroyed card? almost none (if you joust you could win with a card in deck and that's it). The amount of misunderstanding this card gets is troubling. Hahaha oh man, I feel bad for you if you really think this. Fel Reaver's downside often does not matter unless you draw your deck, sure. But that's "often" and not "always". Secondly, and FAR more importantly, this card is nothing like Fel Reaver. This card's downsize DOES matter, and drawing your whole deck has absolutely no bearing on whether this is a bad card. Fel Reaver is an awesome card. This is a terrible card. I've heard this logic used before and it makes no sense. Consider that the probability of drawing any card (say, Tirion) after the mulligan is 1/27, which is about 3.7%. That makes the probability of drawing him 18.5% by turn 5 and 37% by turn 10, without extra card draw. I don't think we'll disagree that a sizable portion of games reach turn 10, right? Well what you're saying is that losing this 37% (and increasing) chance of drawing a game changing card "doesn't matter" because you can just pretend that it was at the bottom of your deck. Even with just a few extra card draws you could have close to 50% chance of drawing Tirion by turn 10, and this changes to 0 when he gets transformed into a chicken. It's like taking all the aces and face cards out of a deck and playing blackjack, and just pretending that your luck was bad and you just didn't happen to draw any during a game. That's a more extreme example but you get the point. I agree. It works that was for spare parts. Yeah I actually saw it happen on YouTube a few hours after posting this. The lil hommie is GEWLD fer sher. This card should transform the minions into Angry Chickens, not just regular chickens. Yes. i came to this page to find out if that was the case. I agree that would be more fun. I'm sure you can see which card is drawn. First, both players see drawn cards that are destroyed if one player's hand is full (similar situation). Two, the gamepedia states that if Inventer transforms Flame Leviathan into a Chicken, the Leviathan's draw effect still triggers, thus it must be visible to the player before that. I came here to discuss if he could work in rogue. I believe he does as 1 mana chicken can function as a combostarter worst case. Also Violet teacher is a scarry card in rogue as they produce 1/1 tokens. 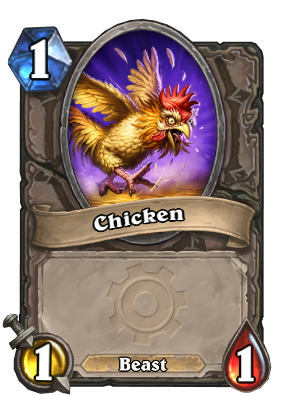 Chicken is a 1/1 1 mana token. stating that it is bad to destroy a minion because it might have purpose seems like nonsense to me. What if the card drawn would be the bottom card from the deck ? What is really the difference drawing it from the bottom or top in a randomised deck ? You draw a card, you simply reduce the deck size by 1 random card. If it happens to be a spell, you get it in your hand. So what it is, its just 3mana for a 3/2 with x% chance to draw a spell card. Ignore the rest. I hear what everyone is saying, but I think this may be the worst card in the game. I mean, even if you draw a card he costs 3 mana for 3/2 so he fails the vanilla test. And if you draw a minion you are really screwed. I feel like this card was made specifically for Rogue. No single minion is too important in a rogue combo deck to transform into a chicken. If you draw a spell, then that's great. That's a 3/2 for 3 with a card draw. If you draw a minion, then whatever. The chicken is a great combo starter anyway and works with Edwin VanCleef, Questing Adventurer, and cards like Eviscerate. It even works with Illidan Stormrage if you're ballsy enough to have him in your combo deck.